I noticed yesterday that I had two day 17s...so we're on to day 21. I'm lucky to be married to a very observant man. He's great for finding things, remembering where I put things, and also finding wildlife and spotting birds when we're camping or hiking. 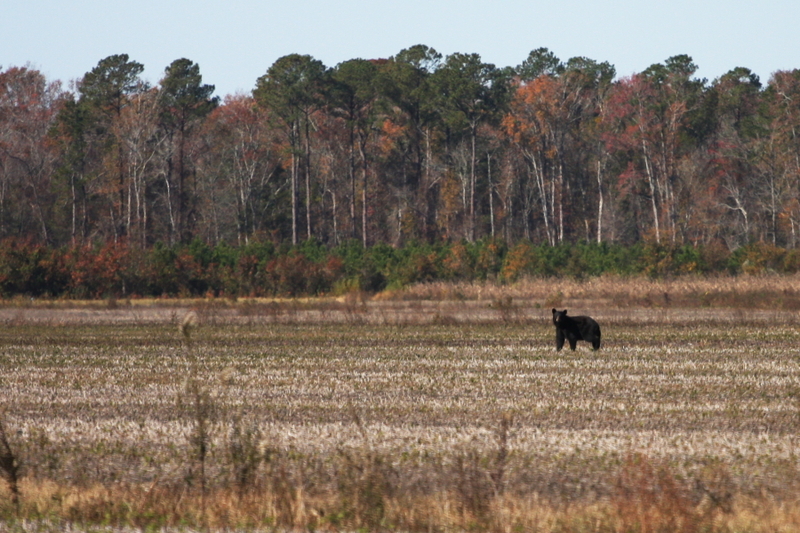 He didn't disappoint on Saturday when we decided to take a day trip to Pocosin National Wildlife Refuge. Our goal was actually to see some migratory birds (Tundra Swans and Snow Geese). We achieved that goal, but clearly we need to go back when they populations swell to nearly 100,000. As we were deciding to drive over to Pettigrew State Park, the GPS took us back through the NWR. 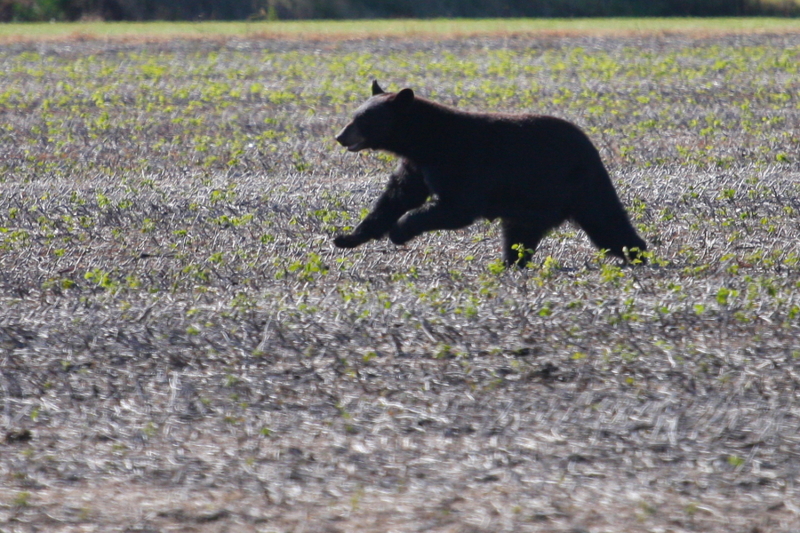 That's when he spotted a few black blobs along the edge of a cleared field. Four bears....a Mama and three cubs. Mama kept an eye on us, despite a great distance between us. Eventually she wandered out to the field and allowed me to get this photo. Eventually we felt we needed to leave her alone and got back in the car and continued down the road. Then we (or he, I should say!) noticed that the bear was headed to the road where we had just been. G turned around quickly and we headed back to try to get a better view. These two photos were taken from the car after an abrupt stop, so they aren't the greatest (and the lighting was now completely different since the bear was backlit as compared to the first photo). 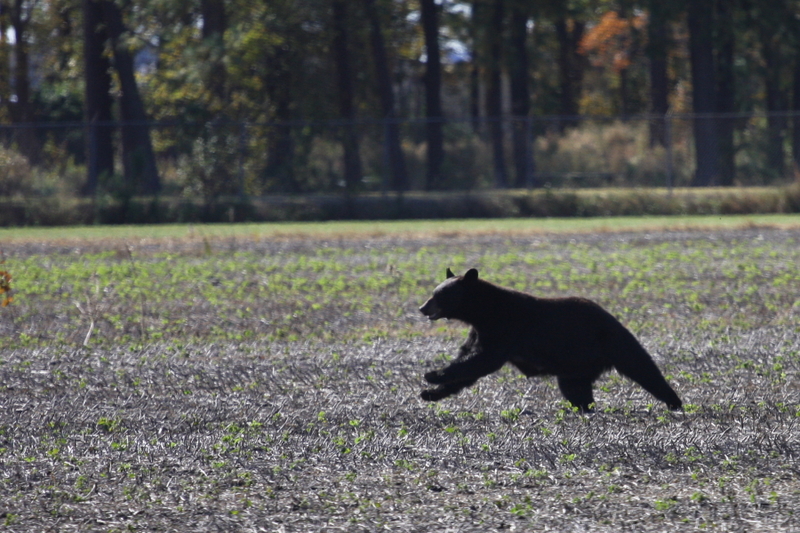 Very cool to see a bear move that quickly. She crossed the road and then into and out of a canal with great ease.